Bankruptcy asset sales of used folding machines. Make your bid! 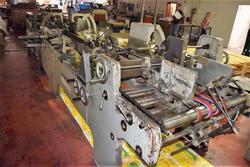 Do you want to buy an used folding machine? Industrial Discount offers you the cheapest solution. All items at auction on our portal belong to bankruptcy procedures and company liquidations; this results in a price much lower than what can be obtained for the sale in the normal market. Moreover, besides the low prices, the items are of excellent quality; you may find new, or mostly never used paper folding machines sold at the same price as the used ones. If you want to check out their condition, contact our staff to ask for information or organize an inspection of the item. Attending an online auction is time and cost-saving: by clicking on the lot of your interest, you can place your bids; moreover, through the Watchlist feature in your account, you can track in real time the bidding activity on your favorite items and check the auctions expiring soon; each item is provided with a full description, technical specifications and sale documents that you can download and review at any time. If you don't have enough time to follow an auction, you can choose to set up the Proxy Bid, our automatic bidding system which will raise your bids on your behalf, according to the maximum price you set. Comfortable, isn't it? If you need any further information, do not hesitate to contact us. We will follow you carefully through each step of the negotiation, from the registration to the delivery of the purchased items. Don't wait any further: register for free and buy an used folding machine at a great price! 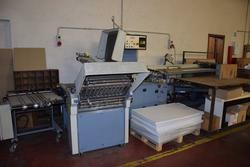 Do you want to stay updated about the upcoming auctions of used paper folding machines? Subscribe to our newsletter! You will receive a weekly email showing new items for sale.